Every frequent traveller has a way of making travel easier. 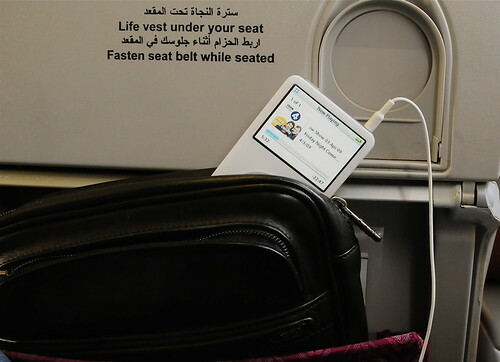 Good airlines have good entertainment systems - at least for long-haul flights. It's not so much the time on these long flights, but more on the short hops. I'm in Doha today. The flight from Kuwait was less than an hour. However, driving to the airport, parking, checking in, waiting in the lounge, security, boarding and waiting for the take-off... and all this before the 55-minute flight. Essential travel companions for me are a laptop (not the work one), a book, and the unbelievably versatile ipod. Although I only converted to Mac recently, I've had an ipod since the very 'beginning' when I replaced my portable CD player. I have everything on it, Quran, audio books, music, documentaries, and more. But what really keeps it alive is the podcasts I subscribe to. One of my favourite genres for killing time is Comedy. The BBC offer Radio 4's Friday night comedy which changes by season. It's my way of keeping myself up-to-date with things in London, a place I consider home. In Kuwait it keeps my sense of belonging to London alive. During travel, it's a home away from home. I still don't know why it took me so long. It's such a better world. Hope you do it soon. That is a nice travel pack! For me the list has grown and your right going to and from the airport has gotten longer then the flight itself! I have my trusty laptop and iPod Touch, a good book and usually I am good to go.. sometimes I take a few other things but its usually unnecessary!